Pharmaceutical Grade Moisturizer that prevents the onset of acne to leave your skin feeling beautiful and fresh again. We combined our Rosehip seed oil from a rare rose with a patented aloe vera extract that has live enzymes and with a botanical complex carbohydrate of select essential sugars which the skin loses in aging. This marriage of liposomes containing moisturizing and nourishing botanicals makes for quick results. The resulting liposomal serum is a simple white milky looking liquid that is not greasy and has an excellent fatty acid content. 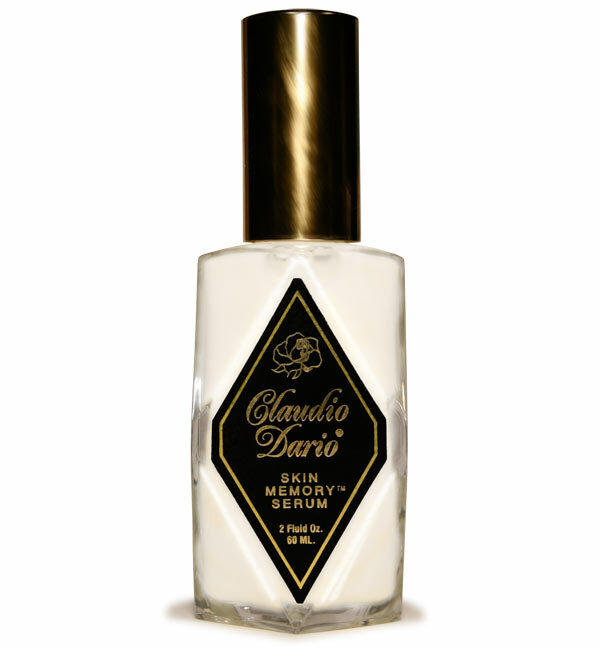 It is called memory serum because it awakens skin to the luster and smoothness you had when your skin was young. Use the Skin memory serum to diminish wrinkles, fine lines, large pores, dark circles and puffy eyes. Your skin will experience dramatic improvement in clarity, color, and elasticity for a smoother more supple complexion, decrease in water vapor loss, decrease in electric conductivity and decrease in Stratum Corneum turn over rate. This penetrating serum also is soothing to rosacea (swelling and reddening of the nose), psoriasis, and acne(use to nip acne in the bud). Purified water, Claudio Dario wild crafted Rose Hip Seed Oil, Lecithin, Enzymes from certified Organic Aloe Vera, Saccharide Isomerate (Botanical Carbo hydrate Complex) Quaternium-15 (preservative used in all international baby shampoos). Pentavitan is a registered trademark of Pentapharm LTD, Switzerland. Wash skin with our skin memory soap. Distribute everywhere (massaging is beneficial). It is important to use liberally and reapply several times successively as each layer will disappear into the skin. Apply additional Serum for problem areas like wrinkles around your eyes or wrinkles around your mouth. Keep glass bottle away from children and contamination. Avoid sunlight, heat, and freezing (refrigeration is not necessary) but will prolong the life of the serum, but avoid freezing by keeping the product on the outside pockets of the refrigerator). Use a little water with the serum(on your face but not in the bottle) to enhance the moisture absorption. For acne wash with a skin memory soap and apply three times a day. When you feel a hardened bump, which is the beginning of the acne blockage of dead cells and sebum coming through the hair follicle, you can nip the acne in the bud by applying several layers of the Skin Memory Serum. By applying in this manner possible traffic jams of oils and dead cells can be encouraged to flow naturally within getting infected. Great for use under Makeup. Use as often as needed. May be used on all parts of the body. Wonderful for dry skin and areas where skin is irritated and flaking. Use on stretch marks and scars to soften and elasticize skin. May be used on sunburned skin, tans to restore color and elasticity and minor burns. For easy shaving, use the evening before to soften hairs and skin. Use on lips and nails. Great for bald scalps to moisturize and smooth. Use 12 oz of water and about 10 sprays into the water and apply to hair while wet but not dripping wet. After your shampoo leave in the hair to condition hair, you may adjust the amount that you need accordingly.